The client is one of the UK’s leaders in the provision of mobile handsets and accessories. A client is supplying and marketing a broad portfolio of handsets and headsets and all mobile related products such as batteries, SIM cards and spare parts through their distribution market focused division. The company has annual turnover around 17 million pounds and deals with 5,000 small and medium sized businesses across the U.K. currently the client is managing 30,000 mobile users. The client is offering complete business solution; from mobile email solutions to IT support to vehicle tracking solutions. Client wanted SilverTouch to assist in the redesigning and redevelopment of a new, more robust and extensible application over the Silverlight 3.0 Technology platform. In accordance to the existing application the client is facing problem with the web application performance due to improper architecture selection and hence wants to rebuild the complete application within its new architecture. 1. WCF service can communicate with the different platform so it is not dependent on .Net only. Any third party application can consume that service and use that service methods. 2. It works on message based communication so it can serve to multiple clients once it is deployed on IIS. No need of any monitoring services. 3. Provide different channels for communication with service and provide different bindings. Vehicle Tracking: Tracks live movement of vehicles having GPS device attached and registered with the application. Display Point of Interest on Map: User defined region, can be used to view nearest assets on map. Asset Management: Vehicle registration of various groups. Group Management: Group is a multiple users within; can track various assets with this application. Reports & Alerts Management: Contains simple to complex reports & alerts e.g. reports and alerts for vehicle exceeds speed of 60 km/h. This application will provide benefit to the transportation business. The service provider can fix three different devices to the assets (Vehicles) which can help to the vehicle owner to track their assets (Vehicles) related real information in present time or any time and also make them enable to view entire tracking report history of each truck and save it to their profile. Vehicle owner can track their truck related information at any time within the use of Google map functionality. Vehicle owner will able to track their assets (Vehicle) related information such as: Latitude/Longitude, Angle/Vehicle direction, Speed of the vehicle, Audometer to know the actual mileage and vehicle status (Going on the way, Idle, Stop etc). Windows Activation Services will keep running and constantly open one socket for communication with the hardware devices. Currently it opens three different TCP listener socket for three hardware devices. This listener will receive data from the device and store it in to the database for displaying it in on to the map. Current data is to be migrated which is in compact edition of SQL and stored in protocol as XML format. There are around ten protocol type (i.e. user, telemetric, group, asset, hardware etc.). Silver Touch will convert these protocol data and store into RDBMS table structure. There are currently approx. 4-5 lacs of data which is to be converted and stored in to RDBMS tables. This WCF architecture increases efficiency of brain for serving multiple clients in terms of requests and responses of si te. Brain requires parsing of request protocol and building response protocol. Hence parsing & building consumes some time on each user action which adds in total 0020 response time to user. As brain has subsequent processes, when any such process is in execution, brain has to wait becoming free for next request in queue. Data is stored in the for m of protocol xml which is again overheads in parsing while retrieving to depict history. Currently SQL Ser ver Compact Edition used which is good for mobility. But this edition has storage limitation up to 4096 MB (4GB) and don’t have support to Stored Procedures and Views which helps in improving quer y performance. Current architecture is not scalable to improve performance by user load balancing. To increase performance, ser ver running .net remoting ser vices has required to being high end as load increases. .Net remoting is allowing consuming APIs or Brain call from kind of .NET Application only. Any third party whosoever want to consume such APIs has to use .NET technologies. Existing website speed is too slow in access by site users which is required to implement with more efficient access. New application is required to implement with additional functionality and History of each vehicle. Need to implement vehicle archive reports (History and Journey reports for each vehicle by date, day and time). The Project was divided into various phases to achieve the best results in less time with optimal utilization of available .Net features, capabilities and new enhancements. 1. Phase I: Understand client existing system approach with the technology platform and create Software design development approach and send to client to let them know the understanding. 2. Phase II: Redesigning database and prepare architecture for the system. 3. 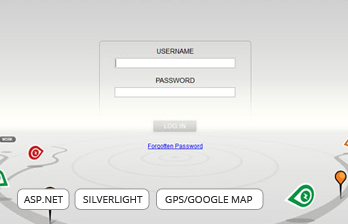 Phase III: Development in new technology platform (Silverlight). 4. Phase Iv: Testing and Deployment of the Application. The application is basically using by truck owners to track their vehicle position. Application is helpful to provide vehicle related information such as: Current position of the vehicle, Past and Current history of the vehicle, Reports and Alerts of the vehicles. GPS based fleet management system.